Does P90X Work For Overweight People? One concern for many people who are overweight is if P90X will work for them. The simple answer is yes. P90X will work for anybody. If you follow the P90X workout plan, do your workouts, eat clean, and drink your Shakeology then you will see results. The task of committing to P90X for the entire 90 days is usually the biggest hurdle many overweight people have to deal with. Heck, its hard for in shape people. When was the last time you followed any kind of fitness plan? It will be a new experience for sure. This is probably a better question to ask. P90X is tough. It challenges everyone regardless of your fitness or health level. The good news is you are shown how to modify the moves to start building up your strength. But the problem that usually comes up from overweight people who I talk to is it’s just too much too soon. I can understand where they’re coming from. P90X is no joke and you’ll probably be pushing yourself harder in those first 10 minutes of P90X Chest and Back then you’ve done in the past 4 years. Yes, You do. You just haven’t set aside an hour in your daily schedule to do it yet. One of the best things I heard from an overweight guy who had success with P90X was “by working out for one hour a day you’ll get so much more life out of the other 23 hours.” Couldn’t agree more. I tell every overweight person asking about P90X to pass on it for now and start with something else. I recommend them doing the Beachbody Ultimate Reset followed by the Power 90 workout and then P90X. Going in this order will start working on breaking old bad habits and replacing them with new good ones. The Ultimate Reset gets you started on a 21 day eating plan that will probably drop 10+ pounds and inches everywhere off your body. Once you got a handle on the eating situation then start working out with Power 90. Workouts range from 20 – 35 minutes long. Its challenging but not too challenging. Then move onto P90X. You’ll have a much better grasp on the eating, built strength, dropped weight from Power 90, and be ready for the crazy hour long P90X workouts. If anything, you’ll be looking forward to starting P90X. There are many P90X success stories from overweight people. With a little bit of patience and determination to hit your goals, overweight people can have success with P90X. Here are a couple of my favorite stories. Pretty moving stuff. Not only did Richard save his own life with P90X he has also gone onto inspire his hometown. Yes, he struggled at the beginning because he was extremely overweight but he did overcome it eventually. 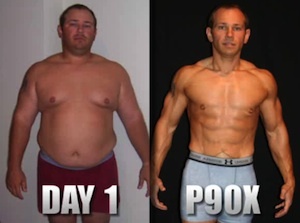 His P90X success story won him $100k at the 2012 Coach Summit. Jeremy Yost was one of the first overweight people to have awesome success with P90X. So much so that he has been on numerous infomercials for Beachbody talking about how overweight people can do P90X. Do you have something in common with Jeremy or Richard? Do you know that you need to make a change in your life? The success will not come as fast for overweight people but it will happen. If you want to see more success stories for overweight people than sign up for a free Beachbody account and check out the message boards. There are hundreds of P90X success stories on there from overweight men, women, young, and old. When you create the account you will also get me as your coach. I am here to help so please reach out to me. What if your not too overweight? I’m about let say 10-20 pounds overweight and I have the dvd’s purchased and I am starting today. I only have two 15 pound dumbbells and a pull up bar so hopefully I can use the dumbbells as a replacement for the push up bars in the meantime.